Hey everyone! 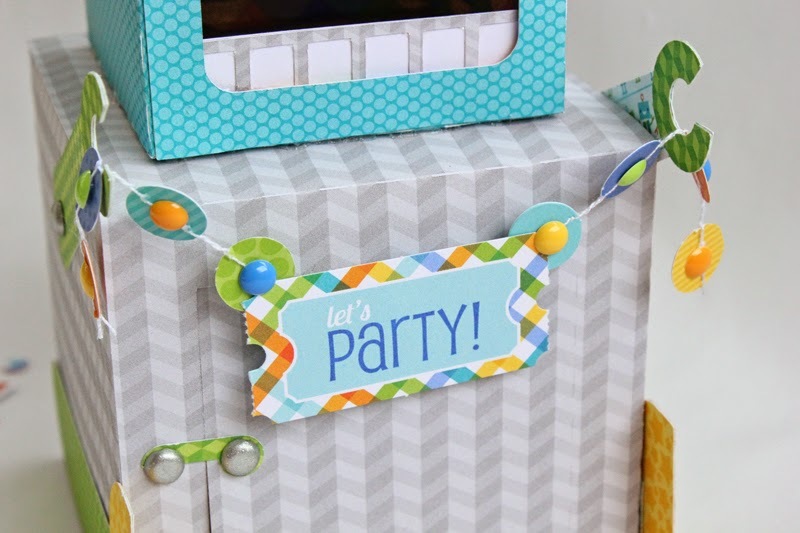 I am so very excited to share my project using the super fun Hip Hip Hooray collection today! 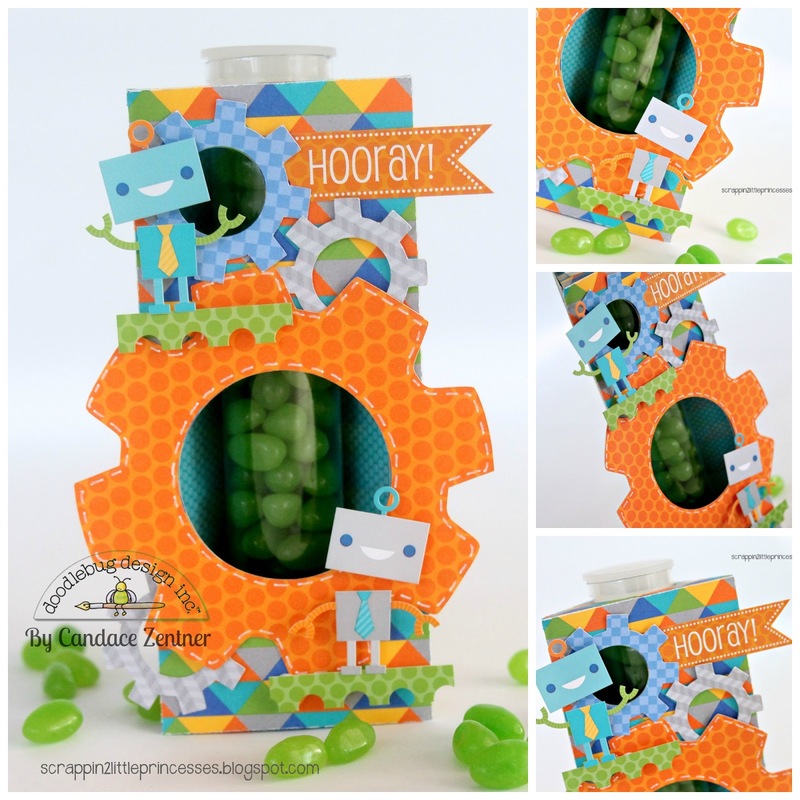 I decided to make a super fun candy tube holder cutting file from the SVG Cutting Files store and embellish it using these great robot stickers. I used foam stickers on the backs of my robots to give my box some dimension. 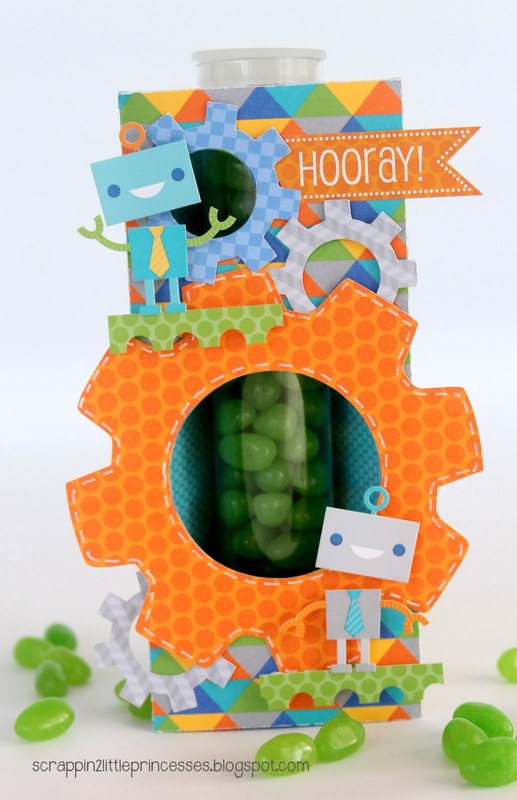 The green Fancy Frill stickers, adhered with foam stickers as well, made the perfect little ledges for my robots to stand on and they matched the gears perfectly. 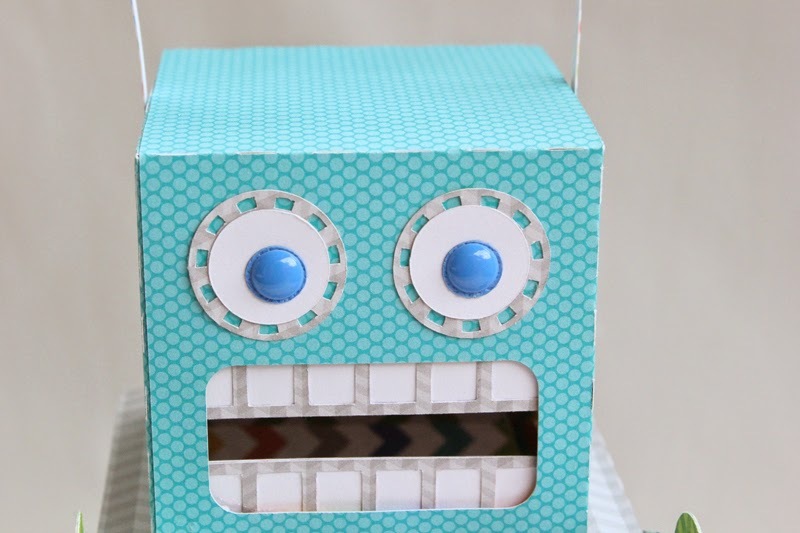 These little robots are soo fun and cute! Did you notice they are wearing ties?! 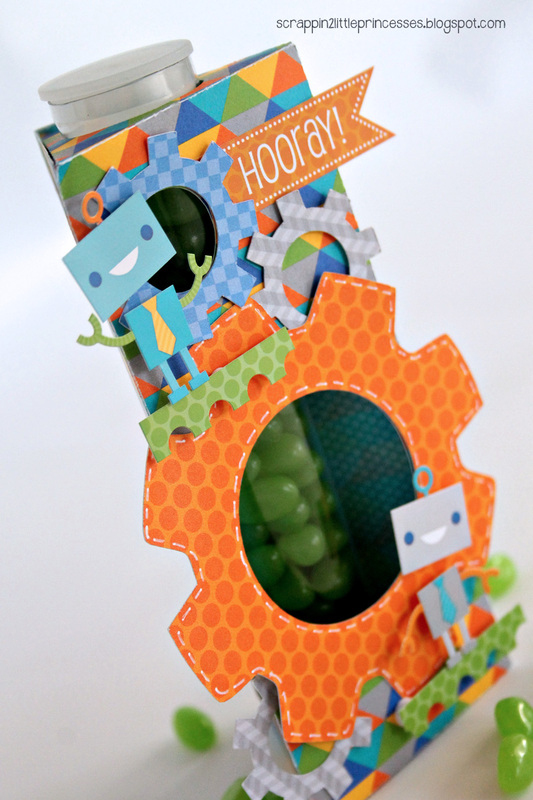 I can't wait to give this fun little gift to one of my nephews on their upcoming birthday! 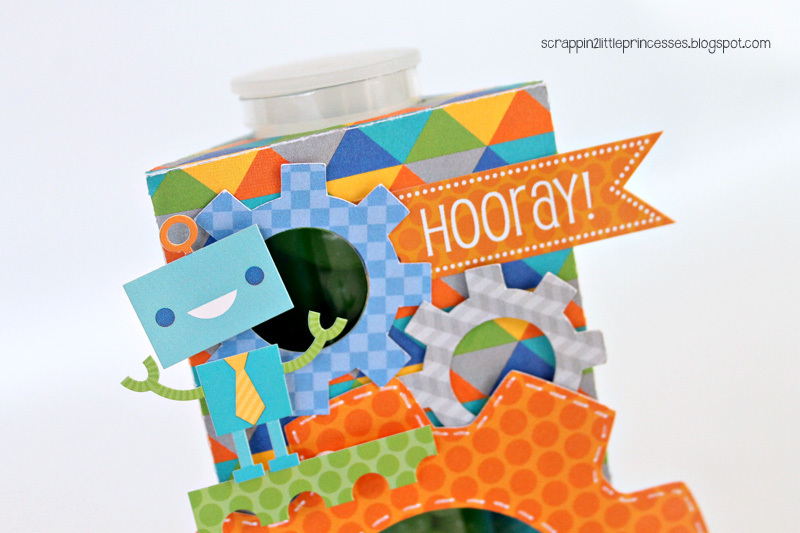 I hope you were inspired and excited by how I used the Hip Hip Hooray collection today! Thanks for stopping by and have a great day! 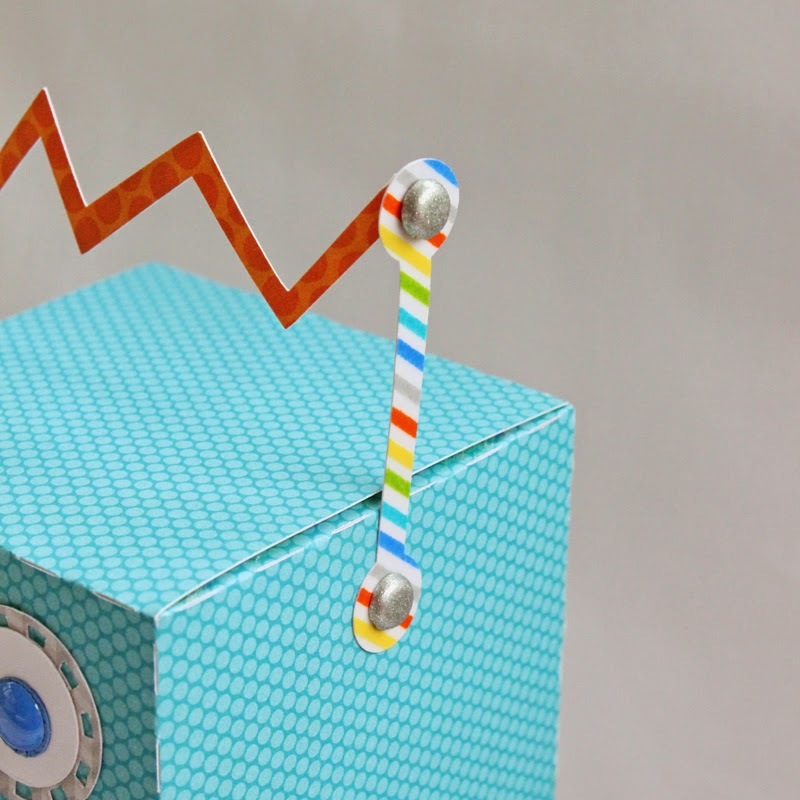 If you're having a birthday party for your little man then gear up for some adorable homemade party supplies you can make with the new Hip Hip Horray collection! My inspiration for this piece came from the adorable little robots in the collection. How cute would he be sitting in the middle of the table?!?! He was actually very easy to assemble using the Robot Box cut from the Silhouette Studio. After I had him adhered together I used a lot of the fun embellishments from the Hip Hip Hooray collection to get him ready to celebrate! To create the antennae i simply added a piece of the striped pattern washi tape to a strip of white cardstock and ran it through my Silhouette. For the eyes, I used some of the blue Sprinkles. I wanted some kind of sentiment so I adhered the "let's Party" ticket to the banner along with some more of the Sprinkles and then just draped it onto his hands. 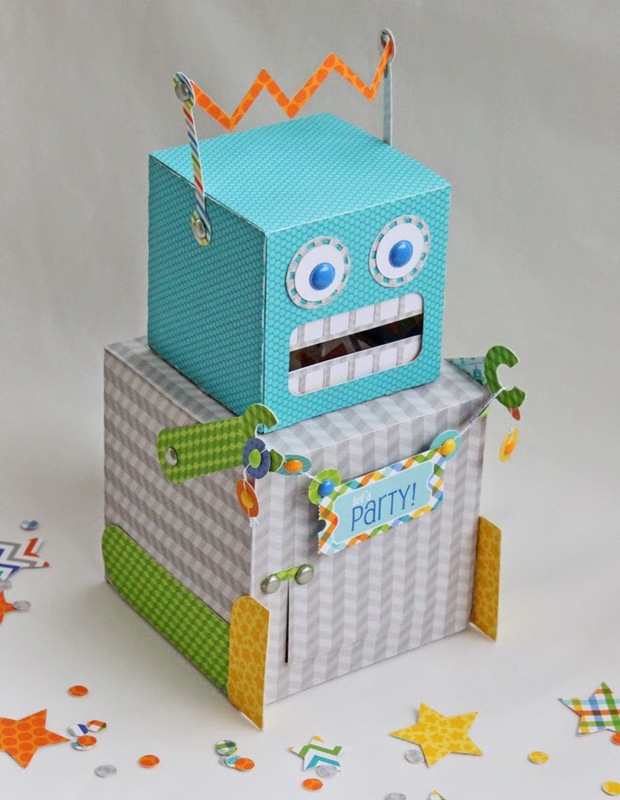 Now this party bot is ready to get his boogie on and let everyone know it's time to PARTY!! I can't even begin to tell you how much fun this collection is! With all of the bold colors and fresh patterns it's sure to be a hit for all your birthday boy needs! Have a great day! HIP HIP HOORAY for Hip Hip Hooray!!! BOTH projects are AMAZING, apart from TEMPTING and INSPIRING, they also remind me that I NEED a Silhouette too - THANK YOU for sharing your CRAFTY AWESOMENESS with us!!! OMG I love this robot! I have to show my little boy, he loves to engage in crafty projects with me. Love these projects they are so flawless!!! I pinned the "Treat tub holder" by Candace Zentner. 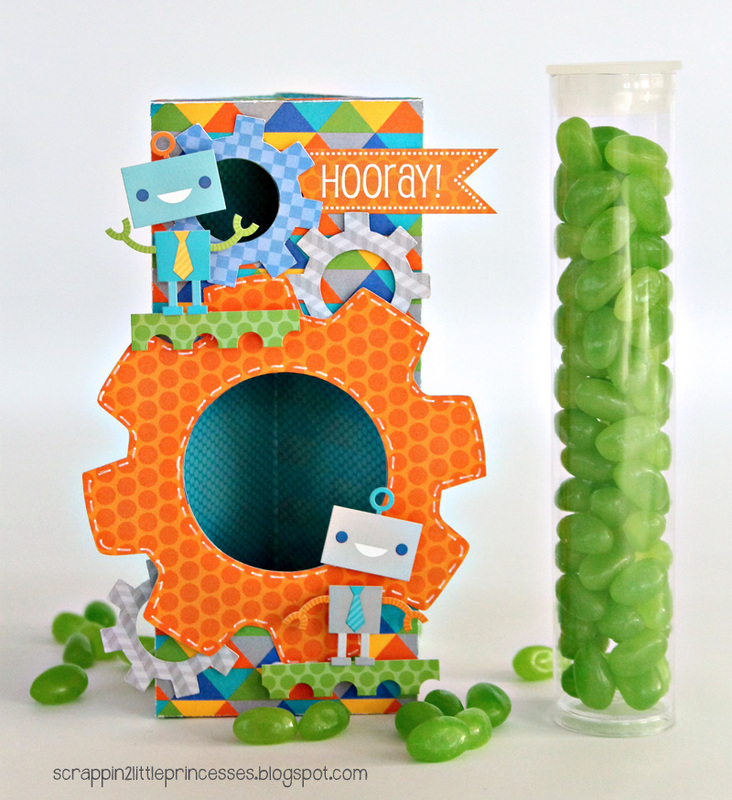 Super cute candy tube and party bot. 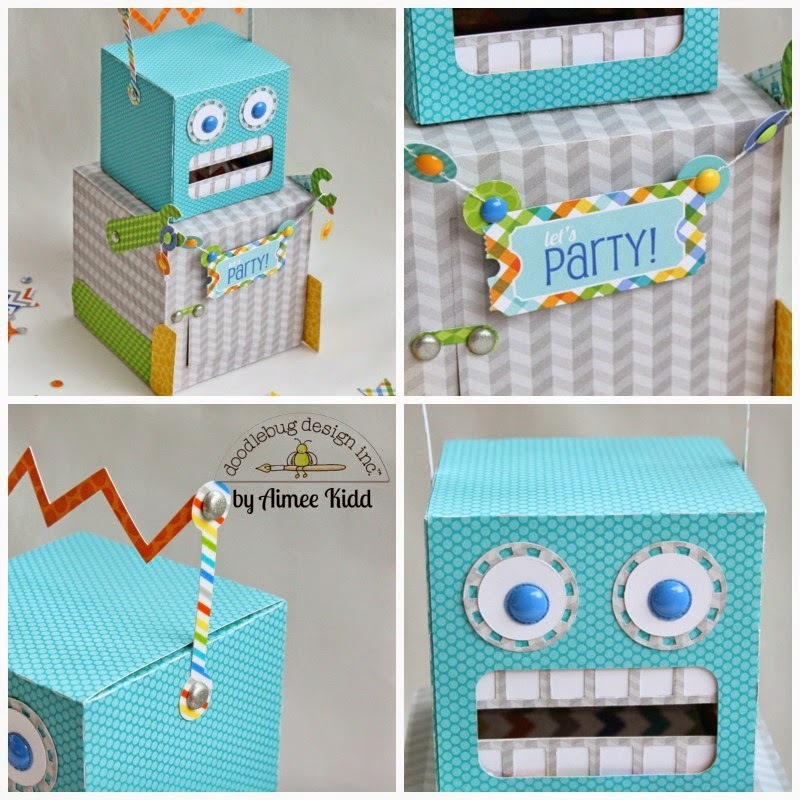 How fun, the robots look perfect for a party! 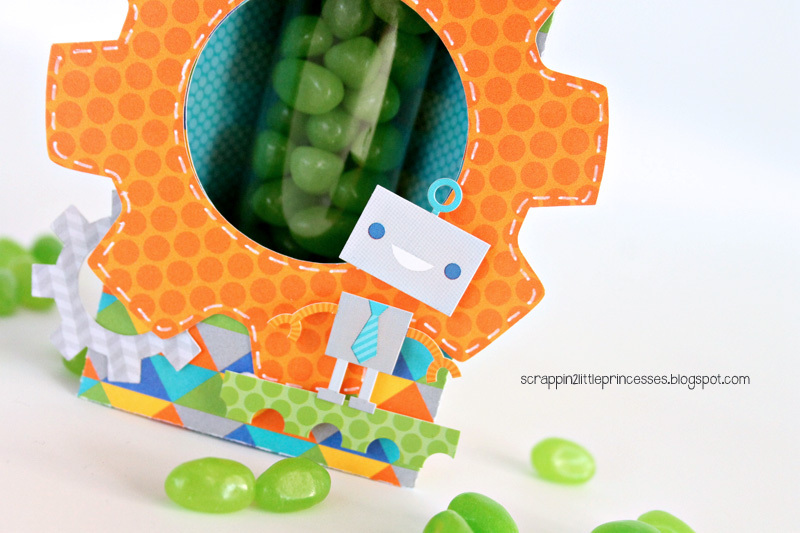 Love the idea of using a candy tube inside the robot! Wow! Each day gets better and better! Thanks for all these amazing projects! I pinned! Such cute ideas! I am loving the robot centerpiece!